The WinWerth® 8.42 measurement software by Werth Messtechnik offers a variety of new functions for multisensor systems and X-ray tomography. For coordinate measuring machines with multisensor technology, in addition to PMI supported measuring, 2D-CAD-Online® and 2D-CAD-Offline® have been integrated into the 3D graphic. The range of functions is dependent on the individual data of the used 2D or 3D-CAD-Model. The new feature, FormCorrect, accelerates product development processes based on X-ray tomography data. Volume Patch Selection provides for the measurement of multi-material workpieces with high lateral resolution all the way up to the outer edges of the workpiece. In addition to depicting CAD models and measurement point clouds, the 3D module now allows to depict voxel volumes in the same coordinate system. 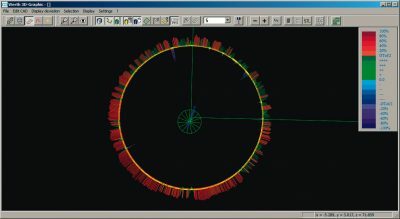 Many other details, such as an improved display of geometrical characteristics in the 3D graphics, the automatic recognition of the geometrical feature when clicking on the CAD model, and color-coded deviation plots with adjustable spike width for improved orientation, increase the user-friendliness.